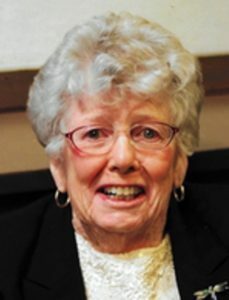 Shrewsbury – Frances Anne Tracy Scannell, of Shrewsbury, passed away peacefully July 17, 2018 at the age of 92, with her loving family at her side. The daughter of the late John F. and Grace (King) Tracy, Frances was born in Springfield, and lived and worked as a teacher after graduating from Fitchburg Teachers College and earning her master’s degree at American International College. She moved to Oregon in 1954 and lived there with her husband, son, daughter, and various animals, until her return to Massachusetts in 2006. Frances worked as an educator into her seventies, teaching in the primary grades and in special education. Frances was predeceased by her husband of 50 years, Jeremiah J. Scannell Jr., who passed away in 2001. She is survived by her son, Jeremiah J. Scannell III and his wife Mary Maureen of Gold Beach, Ore. and daughter Tracy Scannell-Keating and her husband Stephen of Shrewsbury. She is also survived by five grandchildren and many beloved nieces, nephews, family, and friends. Frances was a remarkable woman with a magnetic and giving personality, with a moxie to match. She was full of life and good humor, which she lovingly shared with all those around her. Frances was a passionate advocate, organizer and volunteer – a force all her own. All who knew “Frannie” will never forget her. Mrs. Scannell’s family thanks her Shrewsbury Nursing and Rehabilitation Center family for her excellent care and those who graced her with their love. You know who you are! In lieu of flowers, and in memory of Frances, please consider supporting causes she championed: the Ronald McDonald House, 34 Chapin Terr., Springfield, MA 01107; The Three Rivers Community Hospital, 1505 NW Washington Blvd., Grants Pass, Oregon, 97526 and Autism Speaks. Frances’ family would like to invite family and friends to her calling hours Saturday, July 21, at 10 a.m., at Britton-Shrewsbury Funeral Home, 648 Main St., followed by her Mass of Christian Burial at 12 p.m. at Saint Mary’s Church, 640 Main St., Shrewsbury.